Many health experts, myself included, recommend exercising a minimum of several times a week. This “prescription” is challenging enough due to various factors ranging from lack of motivation to time constraints. But, some committed exercisers have an additional hurdle to overcome: DOMS or delayed onset muscle soreness. In certain cases, you can do all the right things (eat well, hydrate and rest) and still experience persistent muscle pain for hours and even days after you exercise. There are numerous alternative and conventional therapies that may provide symptomatic relief, including acupuncture, hydrotherapy and massage. However, in today’s column I’m going to focus on several dietary supplements which may also be of value for anyone experiencing DOMS. Research indicates that drinking a milk-based protein powder immediately after working out is “beneficial in attenuating decreases in muscle performance and increases in active DOMS”. Some studies have combined milk protein with carbohydrates. Please note that the latter is not necessary to hasten exercise recovery and reduce muscle aches. Also, those who are dairy intolerant or vegans can experiment using plant sourced protein powders with added branched-chain amino acids (BCAAs). To the best of my knowledge, there is no solid research on the use of plant protein powder to mitigate DOMS. That said, there is some data suggesting that the use of supplemental BCAAs (isoleucine, leucine and valine) limits muscle damage and soreness. If protein shakes aren’t your thing or you require additional relief, you might consider three evidence based supplements: 1) pomegranate extract; 2) black tea extract; 3) curcumin. Ellagitannins, a class of phytochemicals present in pomegranates, have been shown to enhance physical performance and recovery after eccentric exercises in two recent studies. A black tea extract, standardized for a high concentration of theaflavins, likewise decreased DOMS and additionally reduced cortisol (a stress hormone) and oxidative stress in college aged weight lifters. Finally, curcumin, a component of the spice turmeric, not only eases exercise induced muscle pain, but also relieves arthritic discomfort. All three of these food based supplements are generally regarded as safe and may even confer a host of cardiovascular and neurological “side benefits”. Funny im reading this after had having and intense workout-out, a few hours ago, and can feel a bit of soreness, lol. I use BCAAs some of the time, some times mixed mixed with whey sometimes on its own, also use a tumeric supplement almost daily with food. These help but if i dont eat well afterwards and dont get a goods night sleep ill for sure have some soreness next day. It sounds like you’re on the right track! Eur J Appl Physiol. 2015 Mar 21. J Am Coll Nutr. 2015;34(2):91-9. The addition of beta-hydroxy-beta-methylbutyrate and isomaltulose to whey protein improves recovery from highly demanding resistance exercise. OBJECTIVE: This study evaluated whether a combination of whey protein (WP), calcium beta-hydroxy-beta-methylbutyrate (HMB), and carbohydrate exert additive effects on recovery from highly demanding resistance exercise. METHODS: Thirteen resistance-trained men (age: 22.6 ± 3.9 years; height: 175.3 ± 12.2 cm; weight: 86.2 ± 9.8 kg) completed a double-blinded, counterbalanced, within-group study. Subjects ingested EAS Recovery Protein (RP; EAS Sports Nutrition/Abbott Laboratories, Columbus, OH) or WP twice daily for 2 weeks prior to, during, and for 2 days following 3 consecutive days of intense resistance exercise. The workout sequence included heavy resistance exercise (day 1) and metabolic resistance exercise (days 2 and 3). The subjects performed no physical activity during day 4 (+24 hours) and day 5 (+48 hours), where recovery testing was performed. Before, during, and following the 3 workouts, treatment outcomes were evaluated using blood-based muscle damage markers and hormones, perceptual measures of muscle soreness, and countermovement jump performance. RESULTS: Creatine kinase was lower for the RP treatment on day 2 (RP: 166.9 ± 56.4 vs WP: 307.1 ± 125.2 IU · L(-1), p ≤ 0.05), day 4 (RP: 232.5 ± 67.4 vs WP: 432.6 ± 223.3 IU · L(-1), p ≤ 0.05), and day 5 (RP: 176.1 ± 38.7 vs 264.5 ± 120.9 IU · L(-1), p ≤ 0.05). Interleukin-6 was lower for the RP treatment on day 4 (RP: 1.2 ± 0.2 vs WP: 1.6 ± 0.6 pg · ml(-1), p ≤ 0.05) and day 5 (RP: 1.1 ± 0.2 vs WP: 1.6 ± 0.4 pg · ml(-1), p ≤ 0.05). Muscle soreness was lower for RP treatment on day 4 (RP: 2.0 ± 0.7 vs WP: 2.8 ± 1.1 cm, p ≤ 0.05). Vertical jump power was higher for the RP treatment on day 4 (RP: 5983.2 ± 624 vs WP 5303.9 ± 641.7 W, p ≤ 0.05) and day 5 (RP: 5792.5 ± 595.4 vs WP: 5200.4 ± 501 W, p ≤ 0.05). CONCLUSIONS: Our findings suggest that during times of intense conditioning, the recovery benefits of WP are enhanced with the addition of HMB and a slow-release carbohydrate. We observed reductions in markers of muscle damage and improved athletic performance. J Int Soc Sports Nutr. 2015 May 11;12:22. Influence of a montmorency cherry juice blend on indices of exercise-induced stress and upper respiratory tract symptoms following marathon running–a pilot investigation. J Bodyw Mov Ther. 2015 Jul;19(3):458-63. Effect of massage on DOMS in ultramarathon runners: A pilot study. In recent years, the popularity of ultramarathons has increased. During these competitions, musculoskeletal problems are very common. Among the more frequent of those problems is the onset of muscle pain, which is defined in the literature as delayed-onset muscle soreness (DOMS). The present study aimed to collect epidemiological data regarding the onset of musculoskeletal problems during the Tor des Geants (International ultramarathon race of 330 km in length and 24,000 m in elevation difference) and to describe the effects of massage on reducing pain and overall perceived improvement in a sample of 25 athletes who complained of DOMS. Two hundred and twenty-one treatments were performed on 220 ultramarathon runners, of which 207 were males and 34 were females; the age group most represented ranged from 40 to 50 years. The most common symptom was pain, which occurred in more than 95% of cases, and the most affected area was the lower extremities (90% of subjects). In the analysed subjects, treatment with massage generated a significant (p < 0.0001) improvement. The numeric pain rating scale (NPRS) value was 3.6 points on average (SD 2.1) after massage, and there were no cases of worsening DOMS after massage as determined using the patient global impression of change (PGIC). The values of minimal clinically important difference (MCID) in DOMS management were calculated on the basis of the ROC curves and two other anchor-based methods in the PGIC and were 2.8-3.9 points on the NPRS. In the context analysed, massage was an effective treatment to reduce DOMS during the onset of symptoms. Appl Physiol Nutr Metab. 2015 May 8:1-7. Green tea extract supplementation does not hamper endurance-training adaptation but improves antioxidant capacity in sedentary men. The purpose of this study was to investigate the effect of green tea extract (GTE) supplementation combined with endurance training on endurance capacity and performance in sedentary men. Forty untrained men (age: 20 ± 1 years) participated in this study. Subjects were assigned to 1 of 4 treatments: (i) placebo-control (CTRL), (ii) GTE, (iii) endurance training (Ex), and (iv) endurance training with GTE (ExGTE). During the 4-week intervention, exercise training was prescribed as 75% oxygen uptake reserve for three 20-min sessions per week, and either GTE (250 mg/day) or placebo was provided. Endurance capacity, malondialdehyde (MDA), total antioxidant status (TAS), and creatine kinase (CK) were examined. Ex and ExGTE but not GTE improved exhaustive-run time (Ex: +8.2%, p = 0.031; ExGTE: +14.3%, p < 0.001); in addition, Ex and ExGTE significantly increased maximal oxygen uptake by ∼14% (p = 0.041) and ∼17% (p = 0.017) above the values of the CTRL group, respectively. Both Ex and ExGTE significantly decreased the increase of CK by ∼11%-32% below that of CTRL following an exhaustive run (Ex: p = 0.007; ExGTE: p = 0.001). Moreover, TAS levels increased by ∼11% in ExGTE after training (p = 0.040), and GTE, Ex, and ExGTE markedly attenuated exercise-induced MDA production (p = 0.01, p = 0.005, p = 0.011, respectively). In conclusion, this investigation demonstrated that daily ingestion of GTE during endurance training does not impair improvements in endurance capacity. Moreover, endurance training combined with GTE not only increases antioxidant capacity without attenuating endurance training adaptations, but also further attenuates acute exercise-induced CK release. Eur J Appl Physiol. 2015 Nov 4. PURPOSE: Foods rich in antioxidant and anti-inflammatory phytochemicals might attenuate skeletal muscle damage; thus, the present study investigated whether consuming an antioxidant rich beetroot juice would attenuate the muscle-damaging effects of eccentric exercise. METHODS: Using a double blind, independent groups design, 30 recreationally active males were allocated to consume a high dose of beetroot juice (H-BT; 250 ml), a lower dose of beetroot juice (L-BT; 125 ml), or an isocaloric placebo (PLA; 250 ml) immediately (×3 servings), 24 (×2 servings) and 48 h (×2 servings) following completion of 100-drop jumps. Maximal isometric voluntary contractions (MIVC), countermovement jumps (CMJ), pressure pain threshold (PPT), creatine kinase (CK), interleukin-6 (IL-6), interleukin-8 (IL-8) and tumour necrosis factor-α (TNF-α) were measured pre, post, 2 (blood indices only), 24, 48 and 72 h following the drop jumps. RESULTS: CMJ performance recovered quicker (relative to baseline) in H-BT vs. PLA at 48 (91.7 ± 12.2 vs. 74.4 ± 17.3 %; P = 0.009, ES = 1.00) and 72 h postexercise (93.4 ± 7.7 vs. 86 ± 5.9 %; P = 0.046, ES = 1.25). PPT was greater in both the H-BT and L-BT vs. PLA at 24, 48 and 72 h postexercise (P < 0.001); PPT had returned to baseline in H-BT and L-BT at 72 h postexercise, but was still reduced in PLA (80.1 ± 28.9 % of baseline values). MIVC, CK, IL-6, TNF-α and IL-8 were unaffected by beetroot juice (P > 0.05). CONCLUSIONS: Acute beetroot juice supplementation attenuated muscle soreness and decrements in CMJ performance induced by eccentric exercise; further research on the anti-inflammatory effects of beetroot juice are required to elucidate the precise mechanisms. Food Nutr Res. 2015 Dec 18;59:30034. BACKGROUND: Exercise can initiate a cascade of inflammatory and oxidative stress-related events leading to delayed onset muscle soreness. Polyphenols possess antioxidant and anti-inflammatory properties. OBJECTIVE: The current study examined the effects of a proprietary polyphenolic blend (PB), containing catechins and theaflavins, on exercise performance and recovery following an eccentric exercise challenge. DESIGN: Male participants (18-35 years of age) received placebo or PB at a low dose (PB-L, 1,000 mg/d) or high dose (PB-H, 2,000 mg/d) for 13 weeks. During the 13th week of supplementation, participants completed an eccentric exercise (40 min downhill treadmill run) followed by a strength assessment (peak torque on isokinetic leg extensions) pre-exercise, and 24, 48, and 96 h post-exercise. Muscle soreness (subjective questionnaire), markers of muscle stress (cortisol and creatine phosphokinase [CK]), and antioxidant capacity (ferric reducing ability of plasma [FRAP]) were also assessed. RESULTS: PB-H attenuated the decrease in peak torque observed in the placebo group from pre-exercise to 48 h (p=0.012) and 96 h (p=0.003) post-exercise. At 48 h post-exercise, PB-H reduced whole body and hamstring soreness (p=0.029) versus placebo. Chronic consumption of PB improved serum FRAP (p=0.039). As expected, serum cortisol and CK increased from pre- to post-exercise in all groups; however, by 96 h, cortisol and CK levels returned to pre-exercise levels following PB supplementation. At 96 h, the change in cortisol from pre- to post-exercise was significantly greater in placebo versus PB-H (p=0.039). CONCLUSION: These findings show that chronic consumption of PB improved antioxidant status, reduced markers of muscle stress, and promoted strength recovery post-exercise. Eur J Appl Physiol. 2016 Apr 16. Eicosapentaenoic and docosahexaenoic acids-rich fish oil supplementation attenuates strength loss and limited joint range of motion after eccentric contractions: a randomized, double-blind, placebo-controlled, parallel-group trial. PURPOSE: This study investigated the effect of eicosapentaenoic and docosahexaenoic acids-rich fish oil (EPA + DHA) supplementation on eccentric contraction-induced muscle damage. METHODS: Twenty-four healthy men were randomly assigned to consume the EPA + DHA supplement (EPA, n = 12) or placebo (PL, n = 12) by the double-blind method. Participants consumed EPA + DHA or placebo supplement for 8 weeks prior to exercise and continued it until 5 days after exercise. The EPA group consumed EPA + DHA-rich fish oil containing 600 mg EPA and 260 mg DHA per day. Subjects performed five sets of six maximal eccentric elbow flexion exercises. Changes in the maximal voluntary contraction (MVC) torque, range of motion (ROM), upper arm circumference, muscle soreness as well as serum creatine kinase, myoglobin, IL-6, and TNF-α levels in blood were assessed before, immediately after, and 1, 2, 3, and 5 days after exercise. RESULTS: MVC was significantly higher in the EPA group than in the PL group at 2-5 days after exercise (p < 0.05). ROM was also significantly greater in the EPA group than in the PL group at 1-5 days after exercise (p < 0.05). At only 3 days after exercise, muscle soreness of the brachialis was significantly greater in the PL group than in the EPA group (p < 0.05), with a concomitant increase in serum IL-6 levels in the PL group. CONCLUSION: Eight-week EPA + DHA supplementation attenuates strength loss and limited ROM after exercise. The supplementation also attenuates muscle soreness and elevates cytokine level, but the effect is limited. Effects of powdered Montmorency tart cherry supplementation on acute endurance exercise performance in aerobically trained individuals. BACKGROUND: The purpose of this study was to determine whether short-term supplementation of a powdered tart cherry supplement prior to and following stressful endurance exercise would affect markers of muscle damage, inflammation, oxidative stress, and/or muscle soreness. METHODS: 27 endurance-trained runners or triathlete (21.8 ± 3.9 years, 15.0 ± 6.0 % body fat, 67.4 ± 11.8 kg) men (n = 18) and women (n = 9) were matched based on average reported race pace, age, body mass, and fat free mass. Subjects were randomly assigned to ingest, in a double-blind manner, capsules containing 480 mg of a rice flour placebo (P, n = 16) or powdered tart cherries [CherryPURE®] (TC, n = 11). Subjects supplemented one time daily (480 mg/day) for 10-d, including race day, up to 48-hr post-run. Subjects completed a half-marathon run (21.1 km) under 2-hr (111.98 ± 11.9 min). Fasting blood samples and quadriceps muscle soreness ratings using an algometer with a graphic pain rating scale were taken pre-run, 60-min, 24 and 48-h post-run and analyzed by MANOVA with repeated measures. RESULTS: Subjects in the TC group averaged 13 % faster half-marathon race finish times (p = 0.001) and tended to have smaller deviations from predicted race pace (p = 0.091) compared to P. Attenuations in TC muscle catabolic markers were reported over time for creatinine (p = 0.047), urea/blood urea nitrogen (p = 0.048), total protein (p = 0.081), and cortisol (p = 0.016) compared to P. Despite lower antioxidant activity pre-run in TC compared to P, changes from pre-run levels revealed a linear increase in antioxidant activity at 24 and 48-h of recovery in TC that was statistically different (16-39 %) from P and pre-run levels. Inflammatory markers were 47 % lower in TC compared to P over time (p = 0.053) coupled with a significant difference between groups (p = 0.017). Soreness perception between the groups was different over time in the medial quadriceps (p = 0.035) with 34 % lower pre-run soreness in TC compared to P. Over the 48-h recovery period, P changes in medial quadriceps soreness from pre-run measures were smaller compared to TC. CONCLUSION: Results revealed that short-term supplementation of Montmorency powdered tart cherries surrounding an endurance challenge attenuated markers of muscle catabolism, reduced immune and inflammatory stress, better maintained redox balance, and increased performance in aerobically trained individuals. Effects of Fish Oil Supplementation on Postresistance Exercise Muscle Soreness. The aim of this study was to examine the effects of fish oil supplementation on the magnitude and time-course of postresistance exercise muscle soreness. This study was a randomized, placebo-controlled, double-blind trial. Nonresistance trained females were randomized into one of two groups: fish oil supplementation (6 g/day; 5:1 eicosapentaenoic acid to docosahexaenoic acid (EPA:DHA)) or placebo (6 g/day corn/soy oil). After consuming the supplements for one week, participants underwent a single bout of resistance exercise consisting of 10 sets to failure of elbow flexion and leg extension machines. Muscle soreness was measured daily over the next week via grounded visual analog scale while participants continued to consume their assigned supplement. At 48 hours and one week postexercise, soreness during functional movements and limb circumferences were measured. The fish oil group perceived less static and functional muscle soreness than placebo, although the differences were not statistically significant. Effect sizes for resistance exercise-induced static and functional soreness responses were 33 to 42% lower in fish oil versus placebo without changes in upper arm and thigh circumferences. Supplementing the diet with 6 g per day of fish oil may alleviate muscle soreness experienced after resistance training in young untrained females. This study investigated Montmorency tart cherry concentrate (MC) supplementation on markers of recovery following prolonged, intermittent sprint activity. Sixteen semi-professional, male soccer players, who had dietary restrictions imposed for the duration of the study, were divided into two equal groups and consumed either MC or placebo (PLA) supplementation for eight consecutive days (30 mL twice per day). On day 5, participants completed an adapted version of the Loughborough Intermittent Shuttle Test (LISTADAPT). Maximal voluntary isometric contraction (MVIC), 20 m Sprint, counter movement jump (CMJ), agility and muscle soreness (DOMS) were assessed at baseline, and 24, 48 and 72 h post-exercise. Measures of inflammation (IL-1-β, IL-6, IL-8, TNF-α, hsCRP), muscle damage (CK) and oxidative stress (LOOH) were analysed at baseline and 1, 3, 5, 24, 48 and 72 h post-exercise. Performance indices (MVIC, CMJ and agility) recovered faster and muscle soreness (DOMS) ratings were lower in the MC group (p < 0.05). Additionally, the acute inflammatory response (IL-6) was attenuated in the MC group. There were no effects for LOOH and CK. These findings suggest MC is efficacious in accelerating recovery following prolonged, repeat sprint activity, such as soccer and rugby, and lends further evidence that polyphenol-rich foods like MC are effective in accelerating recovery following various types of strenuous exercise. Objective. Probiotics have been reported to support healthy digestive and immune function, aid in protein absorption, and decrease inflammation. Further, a trend to increase vertical jump power has been observed following co-administration of protein and probiotics in resistance-trained subjects. However, to date the potential beneficial effect of probiotics on recovery from high intensity resistance exercise have yet to be explored. Therefore, this study examined the effect of co-administration of protein and probiotics on muscle damage, recovery and performance following a damaging exercise bout. Design. Twenty nine (n = 29) recreationally-trained males (mean ± SD; 21.5 ± 2.8 years; 89.7 ± 28.2 kg; 177.4 ± 8.0 cm) were assigned to consume either 20 g of casein (PRO) or 20 g of casein plus probiotic (1 billion CFU Bacillus coagulans GBI-30, 6086, PROBC) in a crossover, diet-controlled design. After two weeks of supplementation, perceptional measures, athletic performance, and muscle damage were analyzed following a damaging exercise bout. Results. The damaging exercise bout significantly increased muscle soreness, and reduced perceived recovery; however, PROBC significantly increased recovery at 24 and 72 h, and decreased soreness at 72 h post exercise in comparison to PRO. Perceptual measures were confirmed by increases in CK (PRO: +266.8%, p = 0.0002; PROBC: +137.7%, p = 0.01), with PROBC showing a trend towards reduced muscle damage (p = 0.08). The muscle-damaging exercise resulted in significantly increased muscle swelling and Blood Urea Nitrogen levels in both conditions with no difference between groups. The strenuous exercise significantly reduced athletic performance in PRO (Wingate Peak Power; PRO: (−39.8 watts, −5.3%, p = 0.03)), whereas PROBC maintained performance (+10.1 watts, +1.7%). Conclusions. The results provide evidence that probiotic supplementation in combination with protein tended to reduce indices of muscle damage, improves recovery, and maintains physical performance subsequent to damaging exercise. BACKGROUND: Withania somnifera (ashwagandha) is a prominent herb in Ayurveda. This study was conducted to examine the possible effects of ashwagandha root extract consumption on muscle mass and strength in healthy young men engaged in resistance training. METHODS: In this 8-week, randomized, prospective, double-blind, placebo-controlled clinical study, 57 young male subjects (18-50 years old) with little experience in resistance training were randomized into treatment (29 subjects) and placebo (28 subjects) groups. Subjects in the treatment group consumed 300 mg of ashwagandha root extract twice daily, while the control group consumed starch placebos. Following baseline measurements, both groups of subjects underwent resistance training for 8 weeks and measurements were repeated at the end of week 8. The primary efficacy measure was muscle strength. The secondary efficacy measures were muscle size, body composition, serum testosterone levels and muscle recovery. Muscle strength was evaluated using the 1-RM load for the bench press and leg extension exercises. Muscle recovery was evaluated by using serum creatine kinase level as a marker of muscle injury from the effects of exercise. RESULTS: Compared to the placebo subjects, the group treated with ashwagandha had significantly greater increases in muscle strength on the bench-press exercise (Placebo: 26.4 kg, 95% CI, 19.5, 33.3 vs. Ashwagandha: 46.0 kg, 95% CI 36.6, 55.5; p = 0.001) and the leg-extension exercise (Placebo: 9.8 kg, 95% CI, 7.2,12.3 vs. Ashwagandha: 14.5 kg, 95 % CI, 10.8,18.2; p = 0.04), and significantly greater muscle size increase at the arms (Placebo: 5.3 cm(2), 95% CI, 3.3,7.2 vs. Ashwagandha: 8.6 cm(2), 95% CI, 6.9,10.8; p = 0.01) and chest (Placebo: 1.4 cm, 95% CI, 0.8, 2.0 vs. Ashwagandha: 3.3 cm, 95% CI, 2.6, 4.1; p < 0.001). Compared to the placebo subjects, the subjects receiving ashwagandha also had significantly greater reduction of exercise-induced muscle damage as indicated by the stabilization of serum creatine kinase (Placebo: 1307.5 U/L, 95% CI, 1202.8, 1412.1, vs. Ashwagandha: 1462.6 U/L, 95% CI, 1366.2, 1559.1; p = 0.03), significantly greater increase in testosterone level (Placebo: 18.0 ng/dL, 95% CI, -15.8, 51.8 vs. Ashwagandha: 96.2 ng/dL, 95% CI, 54.7, 137.5; p = 0.004), and a significantly greater decrease in body fat percentage (Placebo: 1.5%, 95% CI, 0.4%, 2.6% vs. Ashwagandha: 3.5%, 95% CI, 2.0%, 4.9%; p = 0.03). CONCLUSION: This study reports that ashwagandha supplementation is associated with significant increases in muscle mass and strength and suggests that ashwagandha supplementation may be useful in conjunction with a resistance training program. Biosci Biotechnol Biochem. 2017 Feb;81(2):311-315. Effect of oral theaflavin administration on body weight, fat, and muscle in healthy subjects: a randomized pilot study. 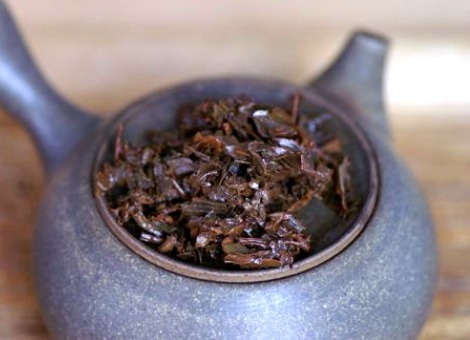 Theaflavins are reddish-colored polyphenols in black tea. To test the efficacy of theaflavin administration on body fat and muscle, we performed a randomized, double-blind, placebo-controlled study and investigated the effect of theaflavins administration on the body composition using of healthy subjects. In this study, 30 male and female Japanese were enrolled and participants were randomly allocated to receive placebo, theaflavin (50 or 100 mg/day), or catechin (400 mg/ml) for 10 weeks. The effects were evaluated using body weight, body fat percentage, subcutaneous fat percentage, and skeletal muscle percentage. Theaflavin administration significantly improved body fat percentage, subcutaneous fat percentage, and skeletal muscle percentage when compared to with the placebo. In contrast, there was no significant difference in all measured outcomes between the catechin and the placebo groups. The results indicate that oral administration of theaflavin had a beneficial effect on body fat and muscle in healthy individuals. Front Physiol. 2017 Mar 31;8:196. Effects of Sesame (Sesamum indicum L.) Supplementation on Creatine Kinase, Lactate Dehydrogenase, Oxidative Stress Markers, and Aerobic Capacity in Semi-Professional Soccer Players. Nutritional intervention with antioxidants rich foods has been considered a strategy to minimize the effects of overtraining in athletes. This experimental, randomized, and placebo-controlled study evaluated the effects of consumption of sesame (Sesamum indicum L.) on muscle damage markers, oxidative stress, systemic inflammation, and aerobic performance in male semi-professional soccer players. Twenty athletes were randomly assigned to groups that received 40 g (two tablespoons) per day of sesame or a placebo during 28 days of regular training (exposed to routine training that includes loads of heavy training in the final half of the season). Before and after intervention, creatine kinase (CK), lactate dehydrogenase (LDH), malondialdehyde (MDA), superoxide dismutase (SOD), C-reactive protein (hs-CRP), and aerobic capacity were evaluated. Before intervention, a physiologic imbalance was noted in both groups related to CK and LDH levels. Sesame intake caused a reduction of CK (19%, p < 0.05), LDH (37%, p < 0.05), MDA (55%, p < 0.05) and hs-CRP (53%, p < 0.05) and increased SOD (14%, p < 0.05), vitamin A (25%, p < 0.05), and vitamin E (65%, p < 0.05) in the experimental group. These phenomena were accompanied by increased aerobic capacity (17%, p < 0.05). The placebo group showed an increase in CK (5%, p < 0.05) and no significant change in LDH, SOD or vitamin A. MDA levels decreased (21%, p < 0.05) and vitamin E increased (14%, p < 0.05) in the placebo group, but to a much lesser extent than in the experimental group. These results show that sesame consumption may reduce muscle damage and oxidative stress while improving the aerobic capacity in soccer players. The training of novice and competitive athletes involves the incorporation of unaccustomed exercise, likely to result in skeletal muscle tissue damage. The initial response, known to result in muscle soreness and swelling, and decreased forced production, is followed by a secondary inflammatory response integral in the skeletal muscle repair and recovery response. Athletes may benefit from a dampening of muscle damage and an accelerated recovery period, to support the performance of consequent bouts at maximal intensity. The antioxidant curcumin is able to counteract the two leading causes of muscle damage, oxidative stress and inflammation, as it interacts with multiple inflammatory pathways. This current study sought to examine the effect of differing doses of a highly bioavailable form of curcumin (CurcuWIN®, OmniActive) on muscle damage and recovery following a bout of muscle damaging exercise by assessing plasma cytokines (IL-6, IL-10, and TNF-alpha), creatine kinase (CK), and perception of muscle soreness (VAS), before, immediately post, 1 hour post, and 24, 48, and 72 hours after a downhill running protocol. Fifty-nine moderately trained men (n=30; 21±2 years; 173.8±20.0 cm; 79.4±11.0 kg) and women (n=29; 21±2 years; 164.9±6.5 cm; 60.1±8.0 kg) were randomly assigned to ingest 50 mg Curcuminoids (in the form of 250 mg CurcuWIN®), 200 mg Curcuminoids (in the form of 1,000 mg CurcuWIN®), or placebo (PLA) for eight weeks in a double-blind, randomized, placebo controlled parallel design. Statistical analysis was performed using NCSS (NCSS 10 Statistical Software (2015); NCSS, LLC. Kaysville, Utah, USA). Statistical models specific to the evaluation of each outcome variable were formulated. 200 mg of Curcuminoids significantly reduced VAS pain scores, reflecting a subjects perception of pain in the thigh area, 24 hours post muscle damaging exercise (−1.74, p=0.03), and showed a trend one hour post exercise (−1.44, p=0.07), and non-significant improvements at 48 (−0.94, p=0.24) and 72 hours (−0.41, p=0.60). Creatine kinase, a marker of muscle damage, increased immediately following the muscle damaging exercise bout and remained elevated for 48 hours post (p<0.001). Curcuminoids supplementation significantly reduced the increase in CK levels over the placebo group when the baseline CK value is held constant at the mean (−19.0 U•L−1, p=0.04 (200mg), and = −27.2 U•L−1, p=0.03 (50mg) respectively), with treatment effects being most pronounced in males. No significant differences were observed between treatments for cytokines at both doses. These data demonstrate curcuminoids reduce muscle damage and improve muscle soreness in healthy young subjects following a bout of muscle damaging exercise. Faster recovery allows for consistent training at competition intensity and might lead to enhanced adaptation rate and performance. J Agric Food Chem. 2017 Jun 7;65(22):4395-4404. Consumption of Watermelon Juice Enriched in l-Citrulline and Pomegranate Ellagitannins Enhanced Metabolism during Physical Exercise. l-Citrulline is a nonessential amino acid precursor of arginine and indirectly a precursor of nitric oxide (NO), which is a vasodilator and increases mitochondrial respiration. On the other hand, the antioxidant pomegranate ellagitannins are precursors of urolithin A, which has been associated with mitophagy and increased muscle function. To elucidate if a single dose of watermelon enrichment with these compounds could have a positive effect after high-intensity exercise (eight sets of eight repetitions of half-squat exercise), a double-blind randomized crossover in vivo study was performed in healthy male subjects (n = 19). Enrichment juices maintained basal levels of blood markers of muscle damage, such as lactate dehydrogenase and myoglobin, and showed a significant maintenance of force during the exercise and a significant decrease in the rating of perceived exertion and muscle soreness after exercise. A positive effect was observed between l-citrulline and ellagitannins, improving the ergogenic effect of watermelon juice. Quercetin phytosome® in triathlon athletes: a pilot registry study. BACKGROUND: Oxidative stress is associated with delayed recovery and higher risk of post-training pain in triathlon athletes. Therefore, supplementation with antioxidant compounds may have a role in enhancing recovery. Quercetin presents marked antioxidant activity. In this pilot registry study, we evaluated the effects of the supplementation with a novel proprietary delivery form (phytosome®) of quercetin in amateur triathlon athletes. METHODS: We employed a specific study model of triathlon according to the “Sprint” distance. The individual triathlon training included repetition of the run 8 times in 14 days. A group of athletes used quercetin phytosome® supplementation (one tablet of 250 mg quercetin phytosome® twice daily). A control group did not use supplementation. All subjects attended a baseline measurement run and a second final measurement run at day 14. At the end of the study, subjective performance, post-training pain, cramps, time to full recovery and oxidative stress were measured. RESULTS: In total, 23 subjects used the supplement and 25 did not. No side effects were reported. The improvement of time to complete the run was greater in subjects on quercetin supplementation compared with the control group (-11.3% vs. -3.9%; P<0.05). Training was considered more valuable in the quercetin group compared with controls (P<0.05). Similarly, post-run muscular pain, cramps, localized pain and the post-exercise recovery time were all considered better with the supplementation (P<0.05). Oxidative stress was also reduced (P<0.05). CONCLUSIONS: This pilot study suggests that the oral supplementation with quercetin phytosome® may result in improved training and performance in amateur triathlon athletes. Food Funct. 2018 Sep 26. Authentic tart cherry juice reduces markers of inflammation in overweight and obese subjects: a randomized, crossover pilot study. Subclinical inflammation is frequently noted in chronic diseases such as diabetes, cardiovascular disease (CVD) and obesity. Accumulating epidemiological evidence demonstrates that diets rich in vegetables and fruits, e.g., cherries, may significantly reduce the risk of chronic disease, in part, via antioxidant and anti-inflammatory activities. In this randomized, placebo-controlled crossover study, we recruited 10 at-risk participants (38.1 ± 12.5 years; 8 females, 2 males) with BMI >25.0 kg m-2 (32.2 ± 4.6 kg m-2; 5 obese, 5 overweight) to consume 240 mL (8 ounces) daily of either 100% tart cherry juice (TCJ) or an alternate placebo beverage, for 4 weeks with a 2-week intervening washout period before switching to the alternate beverage for four weeks. Fasting blood samples were collected at the beginning and end of each arm for measurement of biomarkers of inflammation. The erythrocyte sedimentation rate (ESR), an indicator of chronic inflammation, was significantly (p < 0.05) lower with TCJ than with the placebo beverage, which increased ESR by 19%. Mean baseline hsCRP, an indicator of acute inflammation, was 7.0 ± 5.2 mg L-1 and consumption of TCJ did not affect hsCRP levels. The chemokine MCP-1 and cytokine TNF-alpha were lower in participants after consuming TCJ compared to those consuming the placebo beverage. Plasma IL-6 and IL-l0 were not different between treatments. Collectively, the data suggest that authentic 100% TCJ may reduce biomarkers of inflammation often noted in chronic disease and may be a preferable dietary selection compared to artificially flavored beverages with added sugars. Eur J Appl Physiol. 2019 Jan 8. Montmorency cherry supplementation improves 15-km cycling time-trial performance. AIM: Montmorency cherries are rich in polyphenols that possess antioxidant, anti-inflammatory and vasoactive properties. We investigated whether 7-day Montmorency cherry powder supplementation improved cycling time-trial (TT) performance. METHODS: 8 trained male cyclists ([Formula: see text]: 62.3 ± 10.1 ml kg-1 min-1) completed 10-min steady-state (SS) cycling at ~ 65% [Formula: see text] followed by a 15-km TT on two occasions. Participants consumed 6 pills per day (Montmorency cherry powder, MC; anthocyanin 257 mg day-1 or dextrose powder, PL) for a 7-day period, 3 pills in the morning and evening. Capillary blood [lactate] was measured at baseline, post SS and post TT. Pulmonary gas exchange and tissue oxygenation index (TOI) of m. vastus lateralis via near-infrared spectroscopy, were measured throughout. RESULTS: TT completion time was 4.6 ± 2.9% faster following MC (1506 ± 86 s) supplementation compared to PL (1580 ± 102 s; P = 0.004). Blood [lactate] was significantly higher in MC after SS (PL: 4.4 ± 2.1 vs. MC: 6.7 ± 3.3 mM, P = 0.017) alongside an elevated baseline TOI (PL: 68.7 ± 2.1 vs. MC: 70.4 ± 2.3%, P = 0.018). DISCUSSION: Montmorency cherry supplementation improved 15-km cycling TT performance. This improvement in exercise performance was accompanied by enhanced muscle oxygenation suggesting that the vasoactive properties of the Montmorency cherry polyphenols may underpin the ergogenic effects.